Rakshakaridevi Tilakasuta is a yogini that lives between New Zealand, India and Europe to share Vedic Dharma and the teachings of Advaita Vedanta, Yoga, Meditation and Tantra received at the feet of the Venerable Master Swami Shankaratilaka, Rector of the Vaidika Pratisthanam -Orthodox Yoga School of the Saraswati Order –lineage of Adi Shankaracharya. 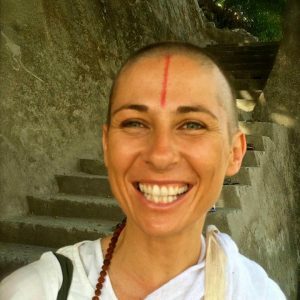 Rakshakari’s passion for Yoga and the Art of Living is unwavering and evidenced by the energy she brings in sharing the teachings she so gratefully received. She’s also a highly experienced instructor having taught in many studios as well as facilitating retreats, workshops and conferences in India and in Europe. Rakshakari brings in the purity of the teaching and the respect for the tradition, while adapting it to modern life and everyday challenges, as the core of spirituality lies in its actual living in one’s own life. Yoga is like an ancient river with countless rapids, eddies, loops, tributaries and backwaters, extending over a vast, colorful terrain of many different habitats. In this Yoga Teacher Training Course we want to give the students a broader picture and a deeper appreciation of the inviting waters of Yoga and of the checkered cultural landscape through which the river of Yoga has flowed in the course of its millennia-long development.